Newlywed couple Deepika Padukone and Ranveer Singh hosted a reception for their close friends and family at Mumbai’s Grand Hyatt hotel on Wednesday. Here are the live updates. What (and who) will Deepika and Ranveer wear? Bollywood couple Deepika Padukone and Ranveer Singh hosted a wedding reception in Mumbai on Wednesday. The party began after 8 pm, and was attended by close family members and mediapersons. The couple hosted a reception in Bengaluru on November 21 and are scheduled to organise another on December 1, this time for their industry friends. The reception was held at the Grand Hyatt, and was organised by Ranveer’s sister, Ritika Bhavnani. The Bengaluru reception was organised by Deepika’s parents, Ujjala and Prakash Padukone. Deepika and Ranveer tied the knot in a secret ceremony in Italy’s Lake Como over a two-day affair on November 14 and 15. Two ceremonies - Konkani and Anand Karaj - were held, and official pictures from the festivities were shared by the couple on their social media upon their return to India. Deepika and Ranveer were given a heroes’ welcome when they touched down in Mumbai on November 17. Stay tuned for all the LIVE updates from Deepika and Ranveer’s Mumbai wedding reception. The entire Padukone and Bhavnani families posed for photographs before the party. Here are a few images. Breaking her tradition of wearing Sabyasachi at her wedding functions - she wore a lehenga by the designer for her Anand Karaj wedding ceremony in Italy - Deepika chose to wear an ivory and gold chikankari sari. Ranveer, meanwhile, wore a Rohit Bal ensemble. Read more about their looks here. Both families coordinated their attire. 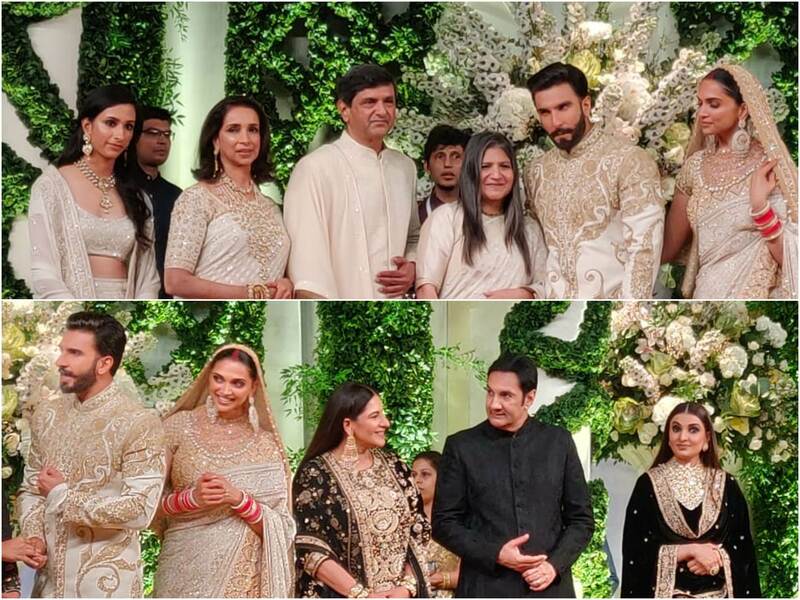 While Deepika’s side wore cream-coloured ethic wear just like her, Ranveer’s parents and sister wore black. Deepika and Ranveer made a regal entrance before the media at their Mumbai reception, wearing Abu Jani and Sandeep Khosla, and Rohit Bal, respectively. Watch a video here. The music being played at the venue is sufi, mostly by Nusrat Fateh Ali Khan. Snacks being served include paneer tikka, bruschetta, maki rolls and Sichuan chicken. “I am not just a lucky guy, I am the luckiest guy in the world, just look at her,” Ranveer told Hindustan Times, pointing at Deepika. He also invited the gathered press to not leave without eating food. Deepika has broken her trend of wearing Sabyasachi at every wedding function. Designer duo Abu Jani and Sandeep Khosla are behind her regal attire for the Mumbai reception. “@deepikapadukone is an absolute dream in this gorgeous Ivory and Gold Chikankari ensemble,” the designers posted on Instagram, crediting the jewellery to Saboo at AJSK. Ranveer, meanwhile, is wearing Rohit Bal - an ivory and gold embroidered sherwani with wide-legged trousers. He previously wore the designer at the first wedding reception, along with his family. Minutes after sharing their official first pictures from the Mumbai reception, Deepika Padukone and Ranveer Singh posed for the gathered media at the venue. They held hands constantly as they smiled for the cameras. Deepika Padukone and Ranveer Singh have taken to their social media accounts to share the first official pictures of their Mumbai reception outfits. They’re both colour-coordinated in cream, traditional attire. Ranveer is wearing a sherwani and Deepika is in a sari, with heavy jewellery. Ranveer's parents, Anju and Jugjeet Bhavnani, and his sister, Ritika, are at the venue's entrance, welcoming guests. Ritika is reportedly hosting the reception. Ranveer’s mother, Anju Bhavnani, made a last-minute inspection of the venue, and posed for the gathered photographers. From floral decorations to grand courtyards, here are a few pictures of all the preparations that have gone into transforming the Grand Hyatt, Mumbai, ahead of Deepika and Ranveer's reception party. Ranveer Singh’s mother, Anju Bhavnani, has been photographed arriving at Mumbai’s Grand Hyatt hotel. She is wearing a black and gold lehenga and was making a last-minute inspection of the venue before guests begin arriving. Anisha Padukone, Deepika’s sister, wore a blue lehenga at the Bengaluru reception. The outfit was a part of Sabyasachi’s ready-to-wear bridal couture collection, An Endless Summer. Alia Bhatt wore a version of the same lehenga at Sonam Kapoor and Anand Ahuja’s wedding reception. While both Deepika and Ranveer have stuck with Sabyasachi outfits thus far - with two exceptions, when Ranveer wore Rohit Bal and Manish Malhotra - fans are excited to see which designer will craft their look for the Mumbai reception. In the meanwhile, why don’t you watch this special making-of video shared by Sabyasachi of Deepika’s red wedding lehenga. While the function is supposed to begin at 8 pm, mediapersons have begun arriving at the venue. Watch a video of the greeting area being set up. Pictures of the 5-star venue, the Grand Hyatt at Santa Cruz, have been shared online. We can see the preparations on in full swing, with decorations being put up. A stage has been set up, and the venue has been decorated with flowers. The white and gold reception invite is simple and classy and bears the names of the two families as the hosts of the evening.